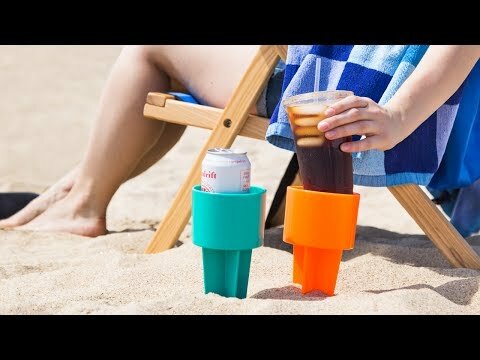 These Made in the USA beach cup holders are a safe haven for your drink when you’re at a beach or lake . . . a place where it won’t get dirty, spill, or get really hot. 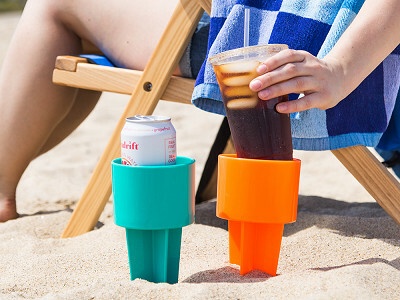 Spiker keeps your drinks and small essentials (think: phone, keys, sunscreen, sunglasses) off the ground and at hand. The bottom of each Spiker goes into the sand, steadying and elevating the holder so it’s not touching the hot ground. Whether you get one just for yourself or get a pack for your whole family, you’ll have a dry, clean home for your beach essentials. Welcome! We're Johnny Butler, founder of Spiker, and Karon Butler, president. We manufacture and are the worldwide distributor of the Spiker Lifestyle Holder, Spiker for short. 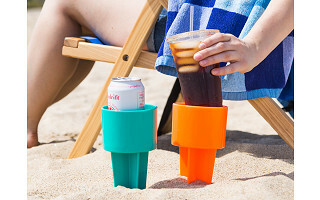 The Made in the USA Spiker is your go-to beach accessory that holds your drink, phone, suncare and more all within easy reach of your beach towel or chair. 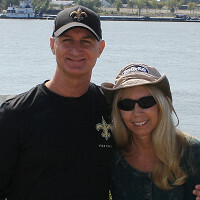 It's an honor to be featured on today's Grommet and we look forward to your questions. Hi Kate, thank you for writing! Spikers aren't insulated but they're made of thick, durable plastic and they stretch 4" across so they will hold your biggest double-wall or stainless steel cups as well as cans or bottles with insulated wraps on them. YES - we're proud of of our always-have and always-will-be made in America stand too! Thank you again. Are these stackable for easy transport? Sue Chehrenegar: Have you thought about customizing some of these, so that they could be sold at beach clubs? @Sue We aren't sure yet if Spiker will be customizing orders, but if you're interested send an email to [email protected], and we can try to work something out for you!